Fabada--maybe the best bean dish in the world. Just when I thought spring was around the corner, a cold front moving across southern Spain dumped snow on the nearby mountains and left me again huddling by the fire. Perfect weather to cook up a pot of beans, which keeps the kitchen windows steamed up and fills the house with its aroma. I like all kinds of beans, but possibly my favorite bean dish is fabada asturiana, beans and sausages cooked in the style of Asturias. Asturias, in the chill northern Cantabrian coast, is noted for its cheeses (such as blue Cabrales), its fabulous seafood and this singular bean dish. 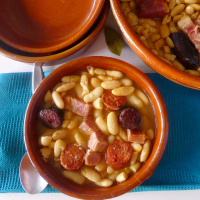 Fabada is so popular that it turns up all over Spain. Sort of as Boston baked beans are not limited to Boston. 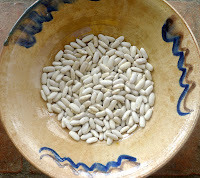 The proper beans for fabada are Asturian-grown fabes. 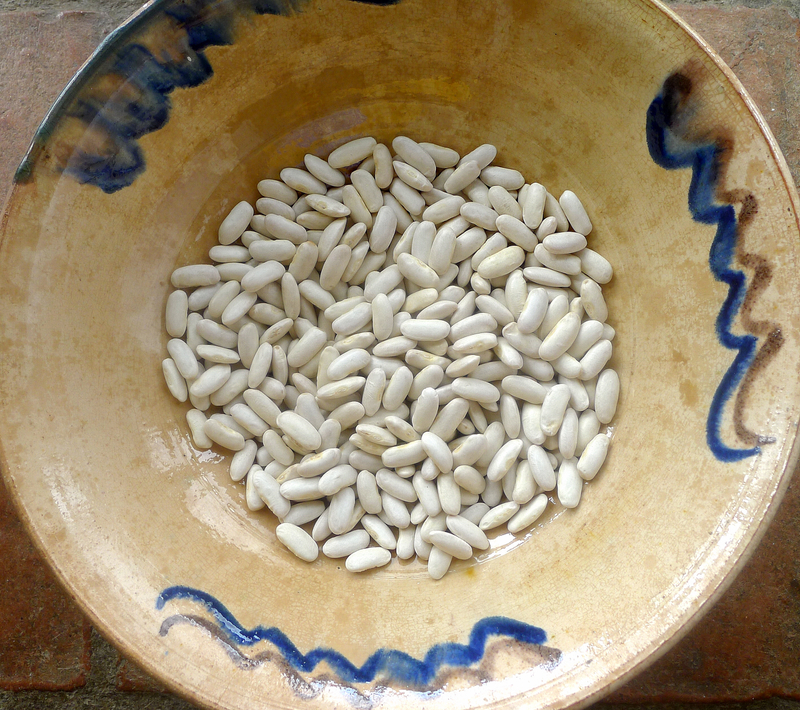 These are extra-large white kidney beans that cook up creamy and tender. (They can be ordered in the US from http://www.tienda.com/) If these are not available, however, I suggest substituting butter beans or cannellini beans. Fabada may be one of the few dishes in Spanish cuisine that contains no olive oil. Panceta, ham bone and two kinds of sausages provide the flavor package. 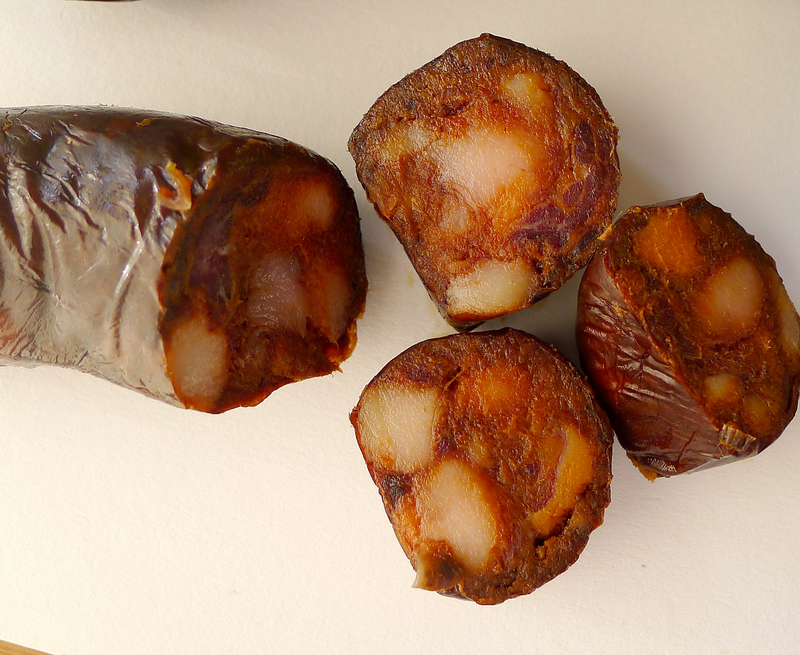 Asturias, with its damp maritime climate, produces chorizo and morcilla (blood sausage) that are, unusually in Spanish charcuteria, smoke-cured. If these traditional sausages are not available, use regular cooking chorizo and morcilla, but add a spoonful of pimentón de la Vera (smoked paprika) to the beans as they cook. 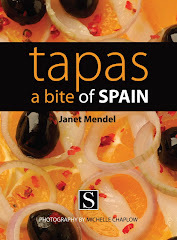 For an insider's view of Asturias, the sausages and fabada, have a look at this site http://www.whereisasturias.com/?p=6602, with a video clip, produced by Jeffrey Weiss, whose book, CHARCUTERIA--THE SOUL OF SPAIN--comes out in the fall. The beans need to be soaked for 12 hours (or overnight) before cooking. I have extremely hard water, so I use a pinch of baking soda in the water or else bottled water with low mineral content to correct the hardness. Otherwise, the beans never get really tender. Drain the soaked beans and put them to cook in fresh water. Fabada is best cooked in a cazuela, a wide earthenware casserole, but any shallow pan will work. Add water to a depth of two fingers above the beans. Keep the beans barely covered with liquid so that the skins don’t split. Soaking swells the beans (left). Drain the beans and put them in a cazuela. Blanch the bacon in boiling water for 2 minutes and drain. Add it to the beans. Add water to cover. Bring to a boil and skim off the froth. Add the piece of ham, chorizo, morcilla and bay leaves. Bring to a boil and skim again. Add saffron, dissolved in a little liquid. Cover and cook until beans are tender, 1 to 2 hours, adding cold water as necessary so beans are always covered with liquid. Add salt and pepper to taste. Don’t stir the beans, but shake the casserole from time to time. Let the fabada rest 15 minutes before serving. Use scissors to cut the bacon, ham and sausages into bite-sized pieces. 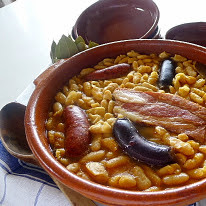 My husband's all-time favorite bean dish, which I make using judiones from Castrillo de los Polvazares just off the Camino de Santiago. He had them in Segovia and saw them later on the menu at el museo del jamón. Going back this fall, God willing! Sue Yurick (not really anonymous!) 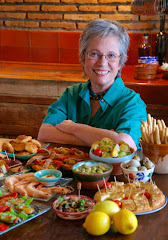 I love cooking the foods I loved in Spain! Sue: Those judiones surely are related to the Asturian fabes. Where is the Museo del Jamón? 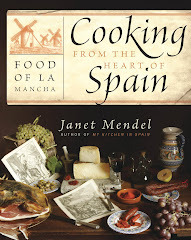 It is so hard to avoid red meat and still eat the foods of Spain, though I managed when I walked the Camino last fall. If you could feature some vegetarian dishes, or those with chicken and seafood, I would really appreciate it! Darlene: You would probably like another Asturian dish, fabes (beans) with clams. Cook beans with onion, garlic, bay, parsley, olive oil and saffron. Open clams separately. Add the clam juice to the beans. Remove clam shells and add the clams to the beans and heat. I have read a little bit your blog. It is amazing and your cook book looks great. Congratulations. Keep in mind our Translation Agency in case you are interested in translations to scandinavian languages or spanish language. This message is sent from our blog. 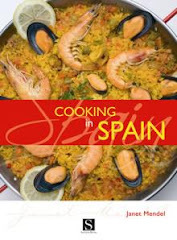 You can find posts about cook books that we have already translated. Anonymous from Extremadura: definitely try substituting other beans, but you can mail order real fabes from La Tienda in the US. 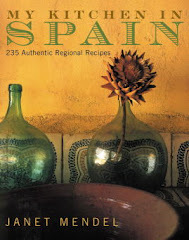 Or, in New Mexico, check out The Spanish Table in Santa Fe--lots of imported products from Spain. Asturiano: Un saludo a ti. Tu foto de merluza a la sidra tiene muy buen aspecto! Hhmmm... and to think that I only thought that Fabada came in a can. I'll be sure to give this a try assuming that I can find some morsilla. Thanks! S/V: You're welcome. Hope you find the morcilla. This sounds very much like a dish I had at the El Duque in Segovia. Are these the same beans they use? 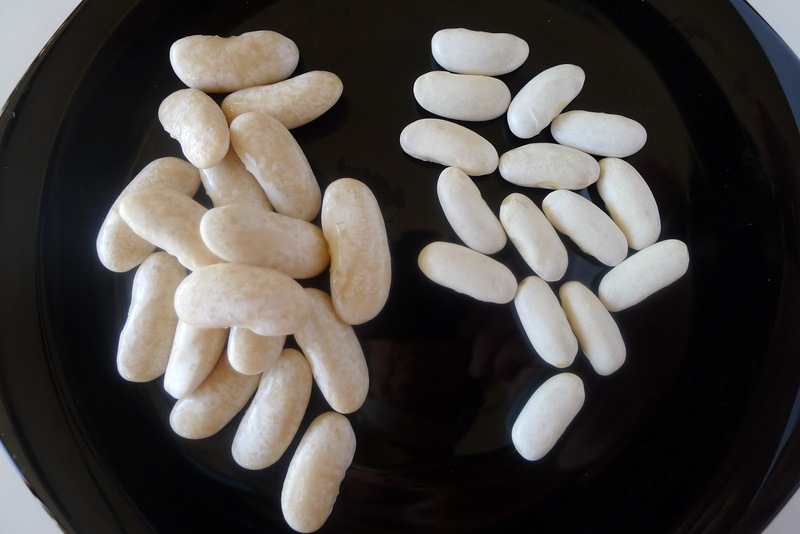 LaTrelle: The bean dish you enjoyed in Segovia is made with judión de La Granja--actually bigger and fatter than the white kidney beans, fabes, of Asturias. 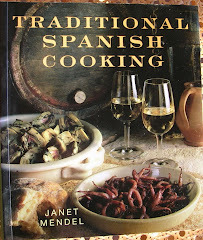 They may be similarly cooked, with morcilla and chorizo. David: Hooray! Fabada! You can order morcilla from La Tienda https://www.tienda.com/search/?q=morcilla%20black%20sausage . However, they don't seem to list Asturian morcilla, which is smoked.